Chelator Bioconjugation Services - Bio-Synthesis, Inc.
Bio-Synthesis offers macrocyclic metal chelator conjugation services by covalently attaching peptides, oligonucleotides, antibodies or drugs to metal chelating ligands that can be used as molecular imaging probes. Relying on our state-of-the art facilities and over 30 years of combined experience in providing high quality chelator-biopolymer complexes, each custom project is meticulously monitored according to Bio-Synthesis's stringent quality assurance and quality control standard, which are fully backed up by a bioanalytical laboratory. The end-products of metal ion conjugates are used for radioimmunodetection, radioimmunotherapy, magnetic resonance imaging, photodynamic therapy or other similar modalities. Contact our Technical Service Center at 800.220.0627 or contact us online with your detailed project specifications. A project manager will be assigned to help you with the design and development of an appropriate synthetic method for your specific project. Molecular imaging has become an indispensable tool in modern diagnostics in biomedical research and therapeutic fields. Thus, the need for highly sensitive and specific molecular imaging probes is still unmet. In order to design diagnostic imaging and radiotherapeutic agents, a high target/background ratio, target uptake and rapid removal of untargeted drug is desirable. Proteins, peptides, antibodies and their fragments are perfect candidates due to high specificity, affinity and selectivity to the target organs. Indirect method of radiolabeling by introducing chelating agents into biomolecules,which complex with certain radioactive metals. This BCA contains two amine-reactive anhydride groups. 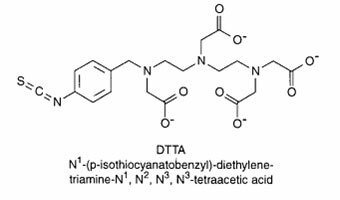 DTPA reacts with N-terminal and ϵ-amine groups of protein to form amide linkage. The anhydride rings open to create multivalent, metal-chelating arms, capable of tightly binding metals in a coordination complex. It has 8 coordination sites with metal ions (from 3 nitrogens and 5 oxygens). This BCA containing four acetic acid carboxylate groups off the four nitrogens of its twelve atom cyclic structure, is capable of modifying proteins and binding radioactive metal ions in strong coordination complexes of up to eight dative bonds. 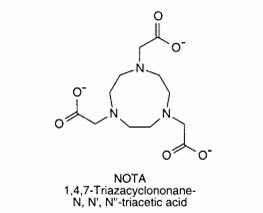 NOTA has a smaller ring structure in comparison to DOTA and only has three chelating carboxylate groups and three nitrogens, it has six coordination sites with metal ions. 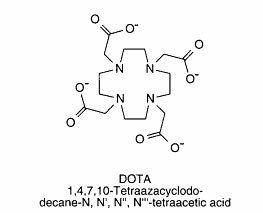 TETA has four chelating carboxylate groups and four nitrogens. 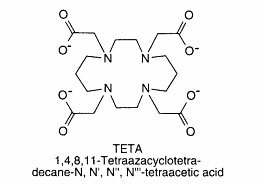 C- and N-functionalized derivatives can be prepare with TETA. A p-bromoacetamidobenzyle-TETA derivative could be used to label antibodies through sulfhydryl groups. This BCA contains four carboxylate groups and three nitrogens that can hold metals tightly in a coordination complex of seven dative bonds. This compound is good at chelating lanthanide element series, such as europium, samarium, terbium and dysprosium.This BCA is primarily used for complexing metals to form fluorescent probes for time-resolved fluoroimmunoassays. Biomolecules supplied by customers should be sufficiently pure. Please provide 5 mgs of starting material with the necessary data for purity assessment. Commercially available biopolymers can be supplied by customers or synthesized and ordered through Bio-Synthesis. A series of metal chelating ligands can be covalently attached to biopolymers such as oligonucleotides, antibodies, peptides and proteins. This indirect method of biomolecule labeling with radiolabels utilizes organic compounds able to chelate metal ions in a coordination complex. They are widely used in nuclear medicine, MRI, and optical imaging applications. These bifunctional chelating ligands can be covalently attached to biopolymers such as oligonucleotides, antibodies, peptides and proteins. They are widely used in nuclear medicine, MRI, and optical imaging applications. Magnetic Resonance Imaging (MRI) contrast agents are a group of contrast media used to improve the visibility of internal body structures using MRI. We offer agents that are being developed for the ability to measure physiological properties such as pH and temperature. Coupling of preactivated small molecules and biomolecules with chemical reactive groups such as amine, thiol, carboxylate, hydroxyl, aldehyde,ketone, and active hydrogen through the use of various cross linkers. CAUTION: Conjugation with an antibody may cause some immunoglobulins to lose antigen-binding activity after modification. Pilot experiments to optimize the amount of protein/antibody present and the quantity of metal chelator added to the reaction needs to be done first in order to avoid this type of crosslinking and polymerization. After labeling, final conjugates must first be isolated from excess or unreacted reagent by gel filtration or dialysis. Additional purification techniqies such as stirred cell filtration, tangential flow filtration (TFF), and gel filtration chromatography may also be used to either remove excess reagent or isolate and characterize the cross-linked product. For reagents (mostly protein and other biological molecules) that are similar in size or larger than the antibody,one must resort to other purification techniques such as affinity chromatography,ion-exchange chromatography, and hydrophobic interaction chromatography. Cross-linked target molecules may then be further characterized by biochemical or biophysical techniques. Once the product has been purified, it may be subject to many different types of studies including spectroscopic (MALDI-TOF, ESI, LC-MS Fluorescence), electrophoresis, immunochemical, biochemical, and enzymatical analysis. QC (quality control) and QA (quality assurance) procedures are also followed independently to offer you double guarantee for the highest quality possible. Moreover, our dedicated technical account managers will guide you through every step of the process and constantly keep you informed of the latest project progress.